providing quality pool cleaning service, pool repairs, pool remodeling service, pool resurfacing, pool tile repairs & pool filter cleaning service in McKinney, Tx. 2 ways to save your pool tile & pool coping before it’s too late! 2 ways to save your swimming pool coping before it’s too late. between the coping (rock, brick, coping stone) and the tile. *note picture above labeled “mortar joint”. between the coping and the deck. *note picture above labeled “deck-o-seal”. The “deck-o-seal” is actually a water barrier. “Deck-o-seal” is a brand name for a two part mix which is poured into the space between the coping and the deck. A sand base is used to fill up most of the space and create a level base. The deck-o-seal is then poured on top of the sand (rules are no deeper than the width of the joint). If applied correctly and if the deck does not move too much, this should last approximately 5 years before needing to be replaced. If you see visible cracks in the caulking-like substance, depending on the size of the crack and length, a small amount of clear 100% silicone can be used to seal the crack as a temporary fix. Otherwise, it is recommended to remove the old deck-o-seal and replace with new. A crack in the mortar between the coping and the tile usually starts around the skimmers and generally happens more rapidly on geometric shaped pools (45 degree angles). The crack can be cut with a 4″ – 4 1/2″ grinder and a diamond blade. This gives about a 1/8″ wide gap to reapply new mortar. If the crack is wider and the mortar starts falling out when cutting, it’s best to chip out all loose mortar and fill with new. Doing this will prevent the crack from going around the entire pool if caught early. If caught in later stages and done properly, it will gain you another 5 years before replacing the coping and tile. **when water gets into cracks and goes below the surface, it doesn’t evaporate and will actually break down the properties of the mortar! For all your pool remodeling needs such as repairs described above, replacing cracked mortar between coping, replacing pool tile and coping, pool re-plastering, and deck-o-seal replacement in McKinney, Tx call Executive Pool Service today at (469) 254 – 7725. 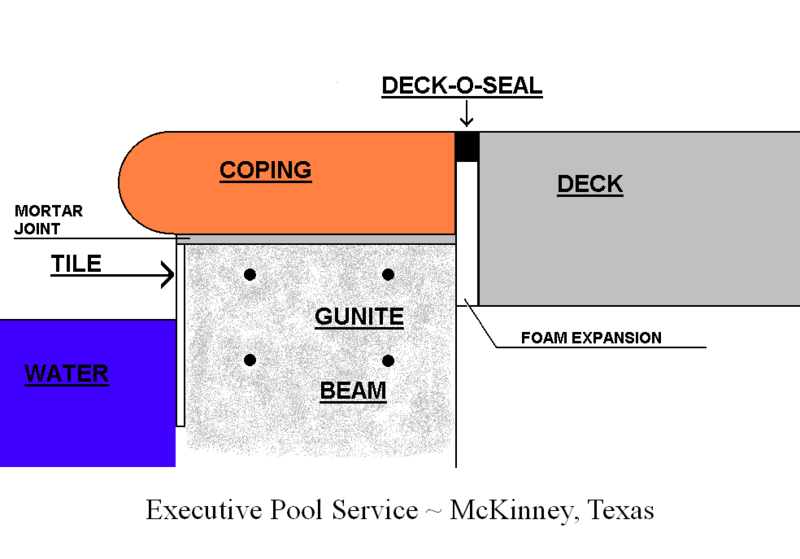 We also specialize in structural issues related to residential gunite pools in McKinney, Texas. Executive Pool Service McKinney, Tx. Pool Remodeling Service McKinney, Tx. Categories: Preventive Maintenance, remodel, renovation | Tags: cracks in pool mortar, deck o seal replacement, executive pool service, pool coping repair mckinney tx, pool remodeling mckinney tx, pool renovation mckinney tx, pool tile repair mckinney tx | Permalink. Our mission is to promote the riders, the parks, photographers & videographers ... website by wakeboarders for wakeboarders ... we want to provide helpful information to the cable wakeboarding community as it expands. There’s a reason why we recommend cleaning DE filters in the spring & fall. Check out our new full website for Executive Pool Service in McKinney, Texas!